These scented candles come made in a cast iron skillet and are great for gifting. Each fragrance has embeds of nuts, berries, cinnamon and more that resemble what the scent of the candle is. There are 3 wicks in each candle to completely melt the wax in the pan. 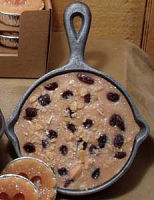 The skillet candles are 5.25 inches diameter. Beautiful candles! I ordered them early enough to receive them in time for Xmas, but when they didn't arrive by 12/23 I called. Jeff made sure a new shipment got to me overnight. Thx SO much Jeff! I would absolutely order from Keystone Candle again!